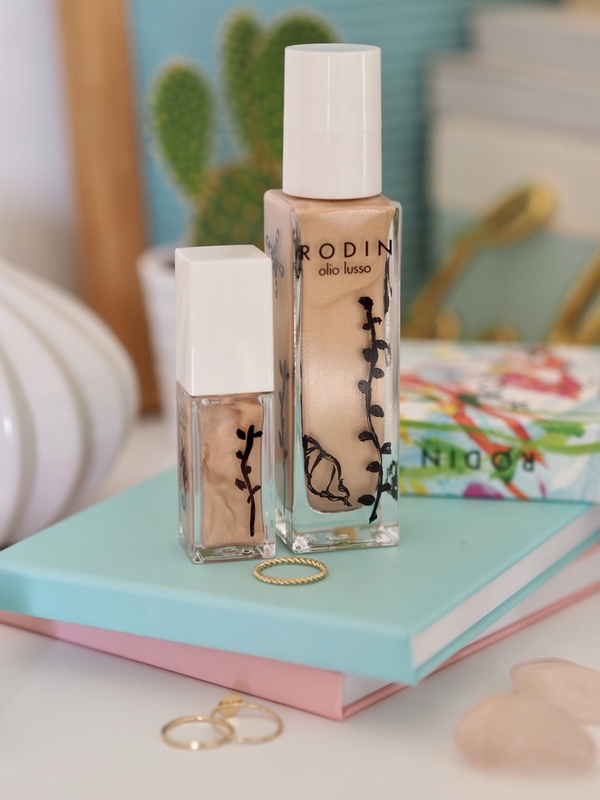 Rodin isn’t a brand I have had a huge amount of experience with in all honesty, but this new Rodin olio lusso Mermaid collection caught my eye and I jumped at the chance to try it. If you like a glow, then take a seat and read on because this collection is one for you. 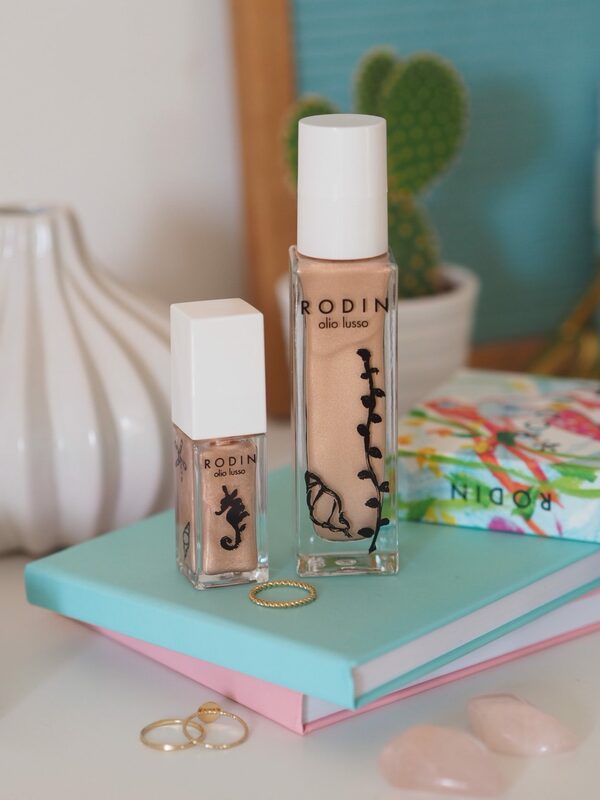 First things first, a little about Rodin olio lusso – just in case it might be a brand you’re less familiar with. A brand created by stylist Linda Rodin after she couldn’t find a skincare range that was both simple and satisfying. She ended up creating the combination of oils she wanted based on essential oils and seeds. The range has a core of 11 oils and the brand has a key belief that keeping things simple is key. With the whole brand being geared towards the idea that luminous skin, healthy hair and a bold lip is all a girl needs. Which I can pretty much agree with. Maybe with a generous coating of mascara and I’m all on board. The core range in general is really interesting. With strikingly simple packaging but still products that feel both luxurious and just a touch playful. It seems to focus on quality but not too serious products. With things like a lip balm ring or bold lipsticks in clear plastic packaging. Some of the lipstick shades are right up my street – with one called Winks (a super-bright pink) looking absolutely gorgeous. But this isn’t really about the core collection, this is a look at the limited edition Mermaid collection that caught my eye. 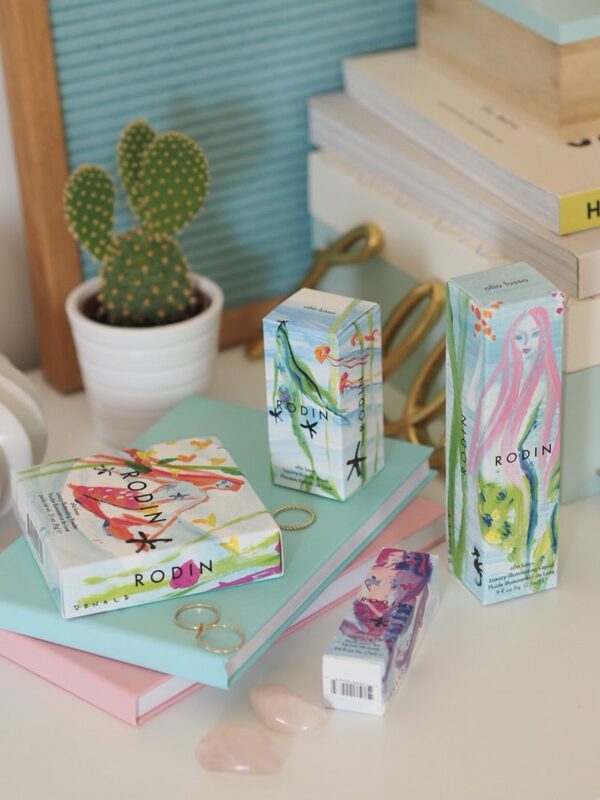 The Rodin olio lusso Mermaid Collection is a collection of four products and one kabuki brush all geared towards glow. The outer packaging has been designed by US artist/illustrator Donald Robertson and features brightly coloured mermaid images. But it’s the products inside that are real stand outs. 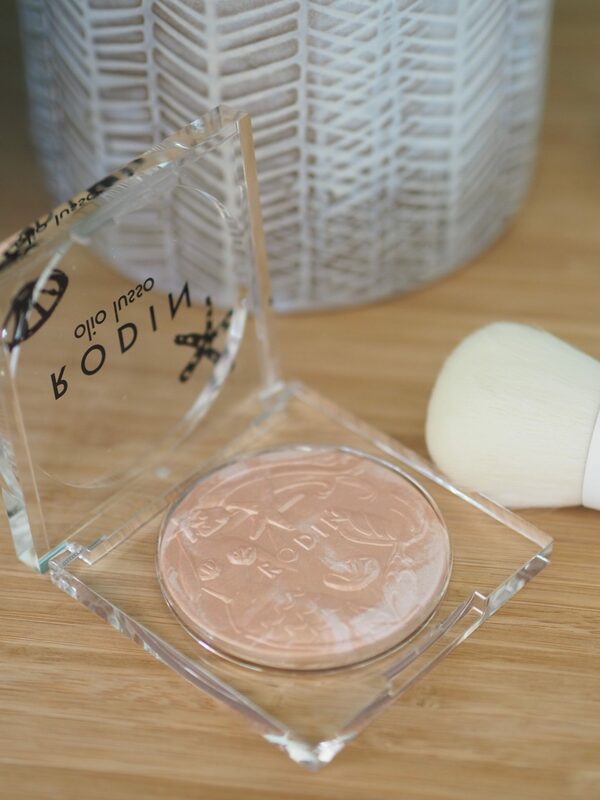 Starting with the first ‘WOW’ one in my opinion, the Mermaid Collection Luxury Illuminating Powder. A gel-powder texture (think gel-powder type things from previous Estee Lauder Bronze Goddess type collections where the powder is so fine it almost feels like a smooth light gel). The colour of this is my ultimate highlight. A champagne type of shade with a hint of pearly pink throughout. 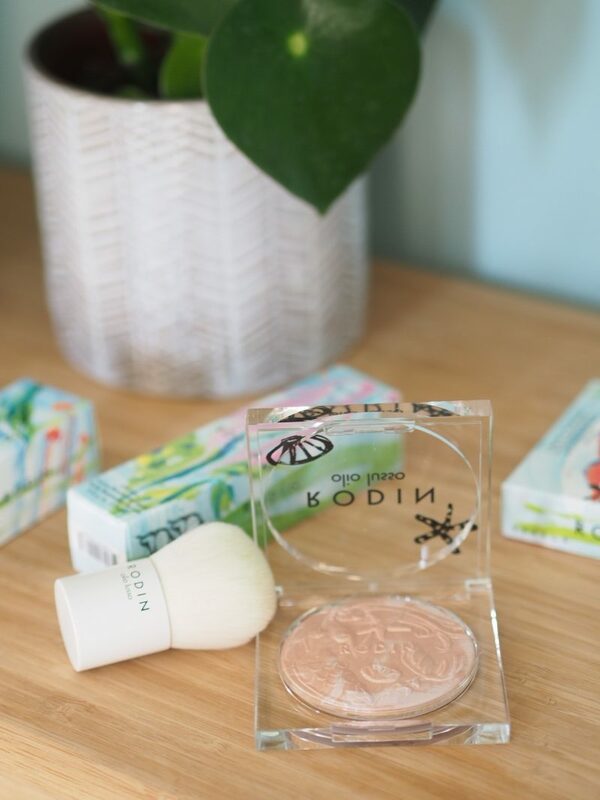 The powder itself is embossed with a gorgeous mermaid scene which if it wasn’t for how gorgeous the colour is I’d be reluctant to use and keep in my ‘too good to use’ pile of collectors items. But seriously, the highlight is just the most beautiful shade. 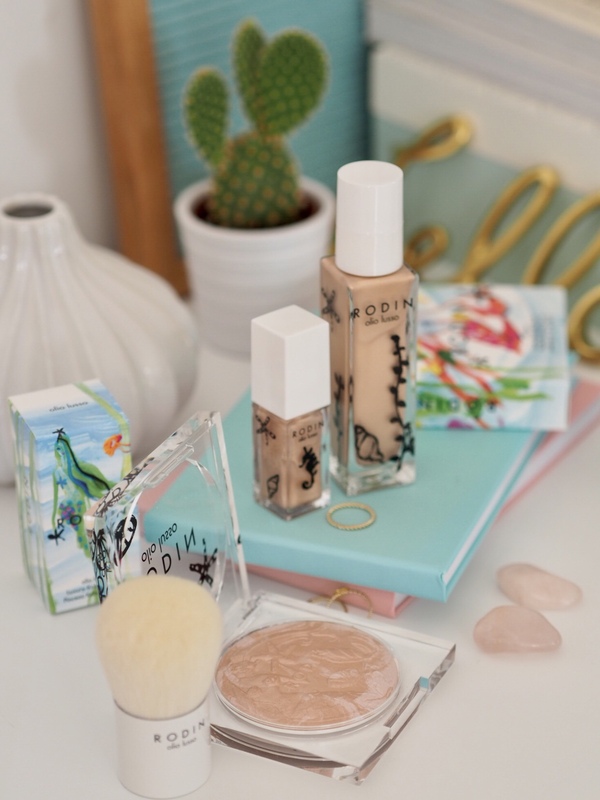 Then, to compliment the sheen of the highlighter there’s a gorgeous Luxury Lip Oil and Liquid Illuminator that would be just perfect for adding a complimentary sheen to shoulders, chest area and legs. Or of course on your face too if you fancy it. No rules here! The lip oil is the same warm champagne type of shade and is a blend of pigment in oil that if you leave it does settle at the bottom. So just needs a shake to get going and then apply and you get a combination of glowy sheen and moisturising lip oil. There’s also one product I don’t have to show you but a Luxury Body Oil – that has a combination of three oils that settle into different coloured layers. So a pretty dressing-table-worthy as far as product goes. Plus a whole lot of moisturising goodness. One of those ones you shake up so you get the benefit of all the oils blended. But then it will settle into layers again after a short time. All in all, this is really a beautiful collection. 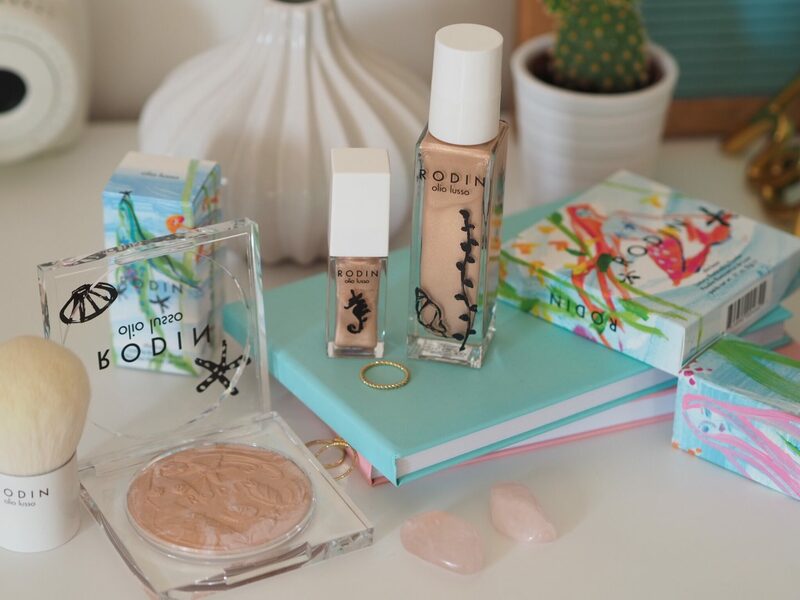 The shade of glow created by these products is just the sort of thing I personally love. That flattering golden champagne is just ideal if you have a paler skintone. I can’t speak for darker skintones really but I expect it would still suit well but perhaps be a bit more stand-out type highlight rather than naturally glowing? But feel free to comment below if you agree/disagree on how it might suit various skin tones.